From time immemorial, the Ĩyãħé Nakoda have known and worshipped a supernatural being called Wakã (Spirit, or God) or Wakã Tãga (the Big God) that created the heavens, earth, the Ĩyãħé Nakoda, and all other beings. Prayers were taught to children by the parents. Those who could not pray could ask another to do so on their behalf. Old men arose at dawn and prayed to Wakã. The Ĩyãħé Nakoda also believed they could communicate with Wakã through four-legged animals. Some had such a complete relationship with an animal that they were recognized as having special powers. Offerings were made to the animals as a connection to Wakã. There was also prayer association through the winged ones (birds). Those who channelled between the visible world and the invisible spirit world were known as a Shaman. Contrary to the belief system of most of the Ĩyãħé Nakoda, some also engaged in sorcery and the casting of spells. Various religious ceremonies were held at certain times during the year for different purposes. Medicine dances were held for the herbs and plants that provided healing for ailments. During the summer months, one or more Sundances were held, each lasting four days. Whoever was conducting a Sundance prepared for it a year in advance. This individual held four ceremonies through the winter months. At the fourth ceremony, it was revealed through a vision where the Sundance would be held that summer. A Sundance was a sacred event, with song and pipes. Children did not attend this great gathering of extreme energy. 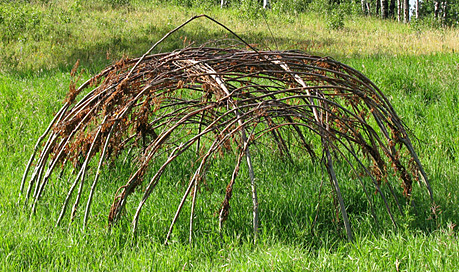 A sweat lodge was made of a certain number of willow branches in a circle that were woven to form a low dome-like structure. It was covered with hides or heavy material. Stones were heated in a fire near this lodge, and were then strategically placed on the ground inside. The ceremonies that took place inside were for religious, purification, or other purposes, but there was generally a spiritual connection. Religious ceremonies were held at various times of the year for spiritual purposes. These included autumn feasts to pay homage to and feed the spirit of a deceased family member on his or her journey to the afterlife. When the missionaries arrived in Ĩyãħé Nakoda territory, their goal was to bring Christianity to the "heathens". They tried to dispel the religious beliefs of the Ĩyãħé Nakoda and made them burn their religious objects. Reverend George McDougall was a Methodist missionary who first visited the Ĩyãħé Nakoda in the 1860s. Some years later his son, John, started a mission and orphanage on Ĩyãħé Nakoda land. It was John McDougall who influenced the people to sign Treaty 7 and forever change their traditional way of life. Many among the Ĩyãħé Nakoda converted to Christianity and took on Christian names. Others maintained their ancestral religious beliefs in secrecy. In the Residential School system that was imposed on the Ĩyãħé Nakoda until 1969, Christian religious education was a component of the curriculum. The Sundance ceremony, sweat lodge ceremony, and other ceremonies held sacred by the Ĩyãħé Nakoda were outlawed by the government, but decades later were allowed to be resurrected. In the last half of the 20th century, with the relaxation of religious dominance by the church and government, many among the Ĩyãħé Nakoda condemned Christianity and Biblical teachings. They gradually revived their sacred ceremonies and publicly embraced their ancestral religious beliefs. Today, there is a blending of Christianity and the ancestral religion of the Ĩyãħé Nakoda. Those among the Ĩyãħé Nakoda who are Christians do participate in Sundances and other religious ceremonies of the Ĩyãħé Nakoda, without compromising their personal beliefs. There is, and always will be, one Wakã.